$99 thermostats will now come loaded with more sophisticated software. EnergyHub has been making some noise lately, and like others in the home energy management space, backing it up with action. 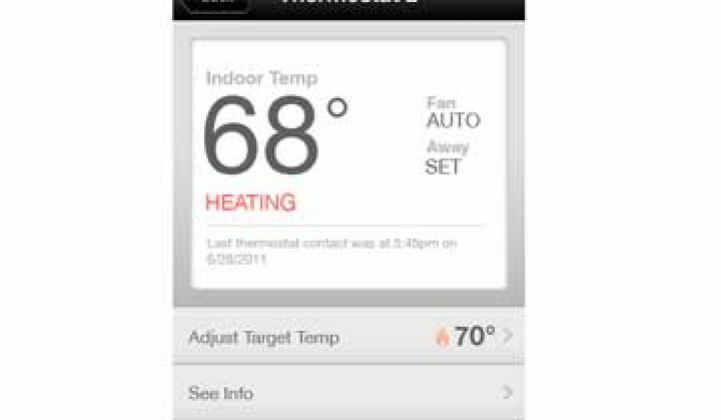 The company announced on Wednesday that it is teaming up with Radio Thermostat Company of America to provide the native software platform for its wireless thermostats. Radio Thermostat is certainly not a newcomer. The company has sold nearly half a million wireless thermostats, and its most recent addition, a $99 Filtrete 3M-branded version that was put on the shelves of Home Depot last fall, has been selling like hot cakes, according to Radio Thermostat. Enter EnergyHub’s Mercury software, which was officially released this summer. The Brooklyn-based company’s SaaS platform is a white-label service for television and cable providers, home security companies and utilities that can ride on top of any wireless thermostat. For Radio Thermostat, it will be available to all new products starting in a few weeks and will replace the software for the Filtrete brand devices already in homes. The previous system had the requisite iPhone app (remote access is what drives these items off the shelves), but with EnergyHub, it will have a more enhanced user experience that will make it easier to set it up and control using EnergyHub’s interface. “You’re going to see a lot more around using analytics and behavioral modifications to help people to make the best decisions,” said Frader-Thompson. Not only will Mercury allow people to optimize their energy settings via a website or smartphone, it will also offer feedback based on the household’s usage and comparison to neighbors. EnergyHub says its system can save up to 20 percent on home energy bills. Currently, the service is free, but there could be additional features that might come at an additional cost down the road. Utilities are also interested in what 3M is putting into people’s homes. The two companies are also jointly selling the thermostat with its software management to utilities and service providers, according to Frader-Thompson. He equates it to the time long, long ago when people were using their work-issued BlackBerry but still paying for an iPhone on the side for personal use, because the iPhone wasn’t considered secure enough for many business applications. Eventually, iPhones were in the hands of so many employees that companies found a way to integrate iPhones into their business culture. EnergyHub is excited about the partnership, but says that this won’t be the last you hear about its Mercury offerings in 2012. The company is not alone in seeking out partnerships that match its software offerings with the right hardware solutions. At GridWeek, Opower announced it was partnering with Honeywell (which is also a partner of EnergyHub) and Tendril reported that it is teaming up with ecobee. With or without utilities, the race into the home is on.